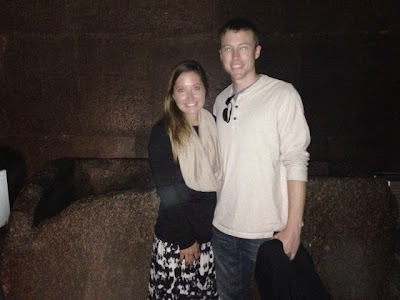 This post is part 3 and also the final installment in the 2014 finale trip. Part 1 is Istanbul for Christmas and Part 2 is Red Sea Diving for New Years. 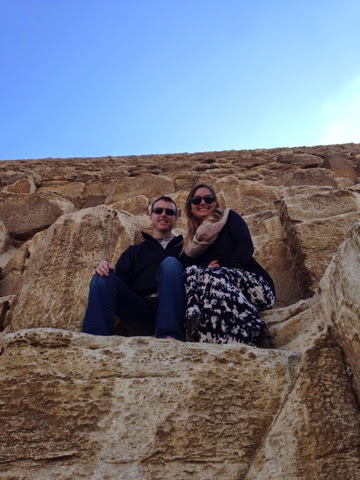 Okay, let me preface this post by saying I LOVE EGYPTIAN HISTORY. Ever since a school project for my LEAP class in grade school (thanks Mrs.Bough! ), I've been hooked. That fire came alive again reading books in preparation for this trip. With 2 decades leading up to this moment, I had high expectations for this visit. 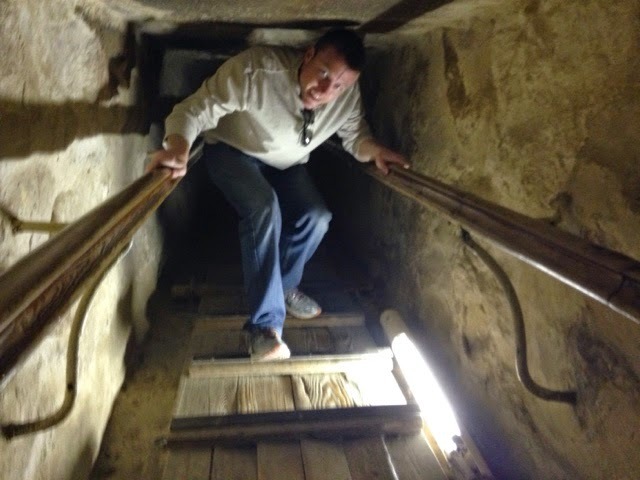 THEN, all of the guides and locals suggested "It's not that great," or "Not what you expect," or "Don't bother going inside the pyramids, nothing to see." Well I call BS!!! It was MORE than I expected and I already can't wait to visit again. Eeeek! 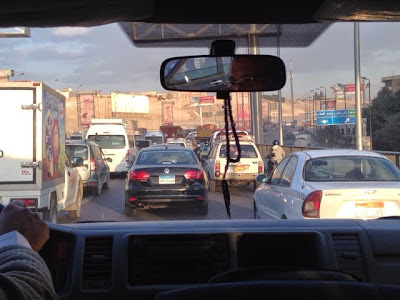 Here we go... Our time in Cairo, Egypt visiting the Giza Plateau. 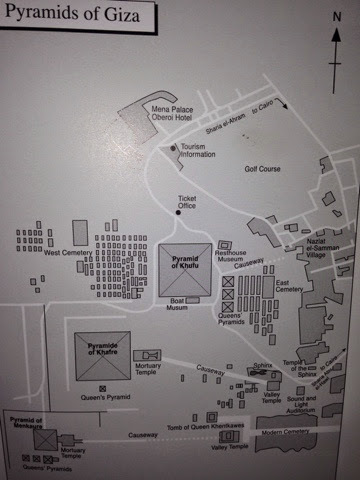 We get picked up by our private travel guide to head SW towards our destination. 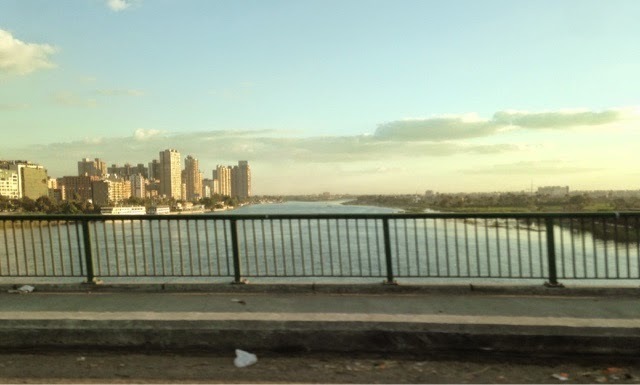 On the way to Giza we see downtown Cairo, a car wreck (which is supposedly rare), and the Nile River. The car wreck being rare comment was interesting.... We were on a 3 lane highway, but somehow traffic was 5-6 lanes wide? However, there were no teenagers texting while driving so that's a plus. 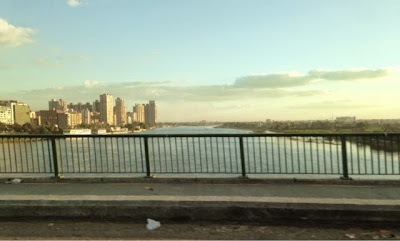 We also drove through a small city called "The 6th of October"... seriously, that was its name. Finally the time has come and we are approaching pyramids. My heart is leaping out of my chest and our guide is telling us some fun facts, but all I hear is the pyramids and pharaohs. So close now! 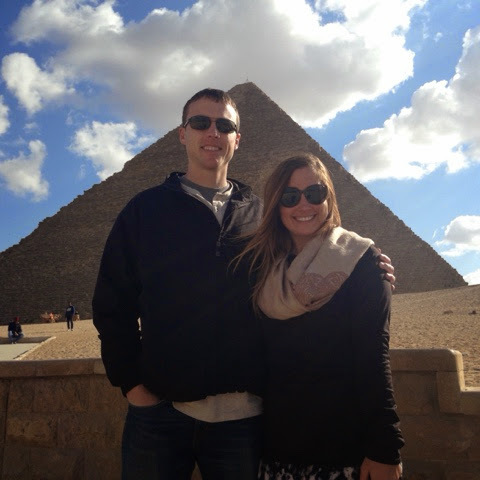 First we buy our tickets to go into The Great Pyramid. 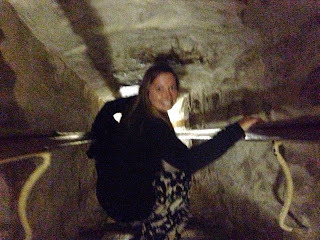 Our guide had already bought our ticket to the plateau itself with our tour package, but to get inside the actual pyramid you had to pay 200 Egyptian Pounds per person... Roughly $28USD/pp. Thankfully our guide had plenty of Egyptian Pounds on him because the pyramids does not accept credit cards or any cash in foreign currencies. Time to go inside the gates! 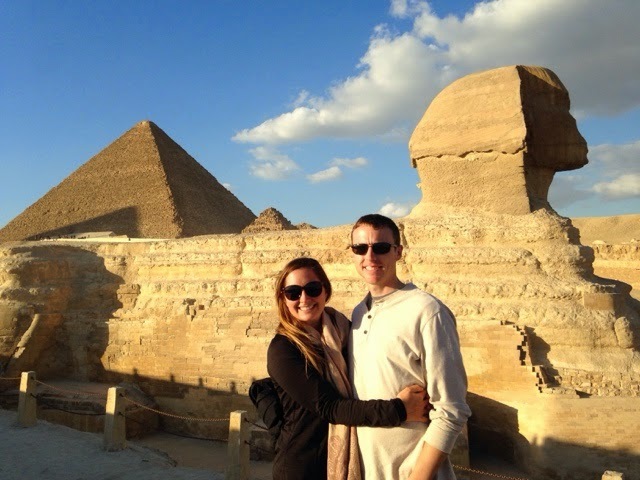 The Giza Plateau houses 3 distinct pharaoh tombs and each one is surrounded by smaller pyramids, temples or cemeteries housing their wives, children, and dignitaries during their reign. The 3 pharaohs are Khufu, Khafre, and Menkaure. To see them in person is BREATHTAKING! 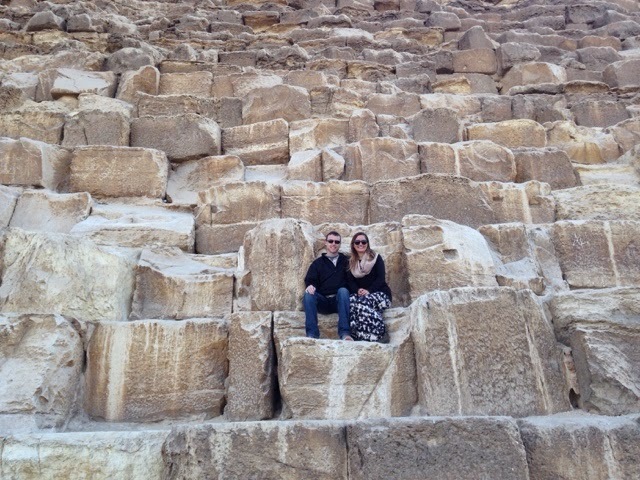 No surprise, we act like total tourists and take pictures of the pyramids from every angle. 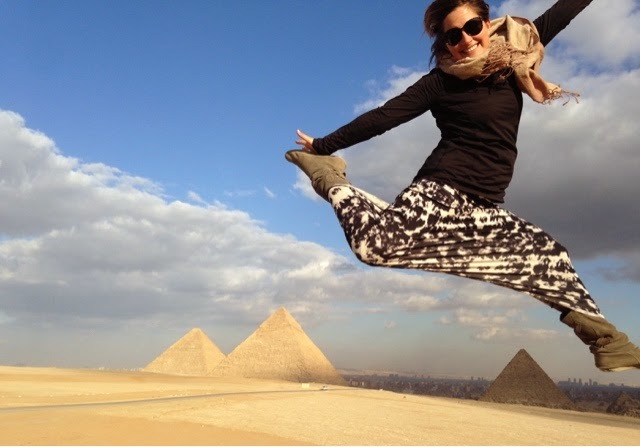 This particular pyramid, the very one we grace our booties with, is The Great Pyramid. The only surviving wonder of the 7 Ancient World Wonders. It was built over a 20 year period circa 2580 B.C. for Pharaoh Khufu. It was originally built to a height of 481 ft high, but the top 31 ft is now missing due to erosion and time. Built at an angle of 51.5 degrees on each side, it is the largest pyramid. On our way inside (picture above shows the entrance to the burial chamber), we saw some tourists panting on their way out. Toby and I looked at each other like they were crazy... And possibly out of shape. THEN, we went inside and found out what the panting was all about. 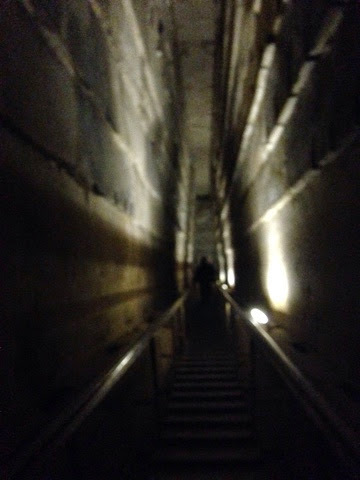 The path to get inside is LOTS of stairs followed by a corridor that is about 3ft high, steep, and long. Plus the "stairs" during this journey are pieces of thin pieces of wood nailed to the sloping floor. Wanna see inside?? Supposedly photos are not allowed inside, but the pyramid rep said "pictures at the top, top secret" sooooo we went with it and got these goodies. Photos below are the best we could do in the dark. Once we were inside, it was a large room with very high ceilings. At the far end of the chamber, there were 5 sides to a rectangular box with the top missing. This was Khufus original tomb! 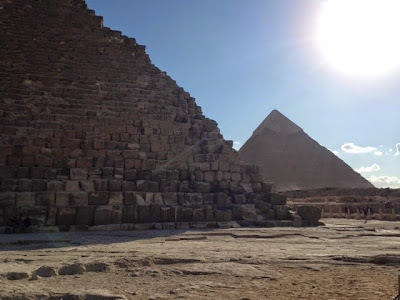 First, It gives the false impression of being larger than The Great Pyramid due to still having the original point height on top, being built on a higher plateau and being built at an angle of 52 degrees as opposed to 51.5 degrees. Today it stands at 469 ft high. 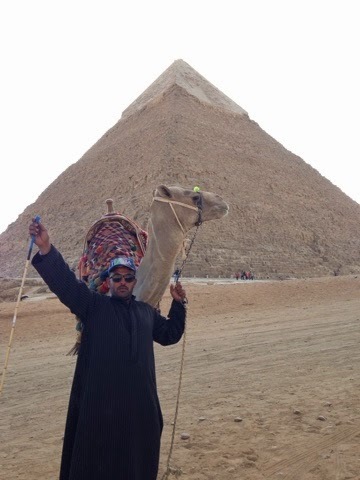 Just behind this camel below, you can see the smooth siding at the top of the Khafre Pyramid. Second thing to note is that the Sphinx is paired with this pyramid. 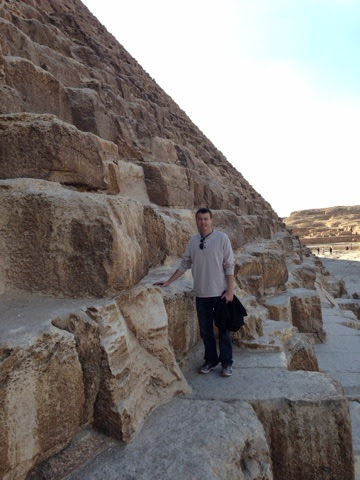 It was built during Khafre's reign in the hopes of guarding his tomb in the afterlife. 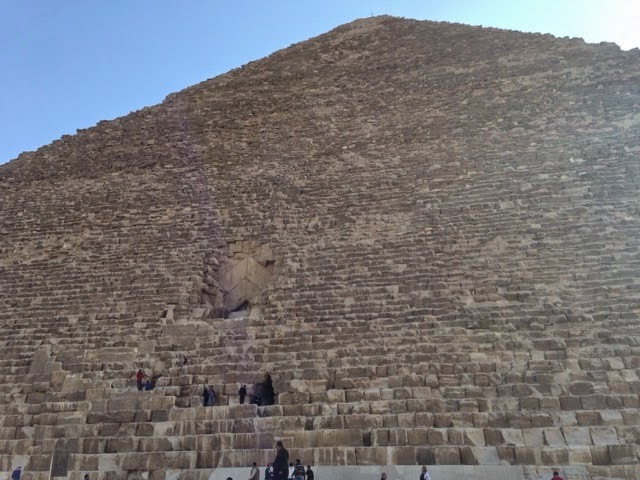 The increased deterioration of the Sphinx in contrast to the pyramids is due to the materials used to build it, as it was built with the leftovers from the quarry for the pyramids. The Sphinx has the face of Pharaoh Khafre and the body of a lion. Ain't he cute?? MWAH! 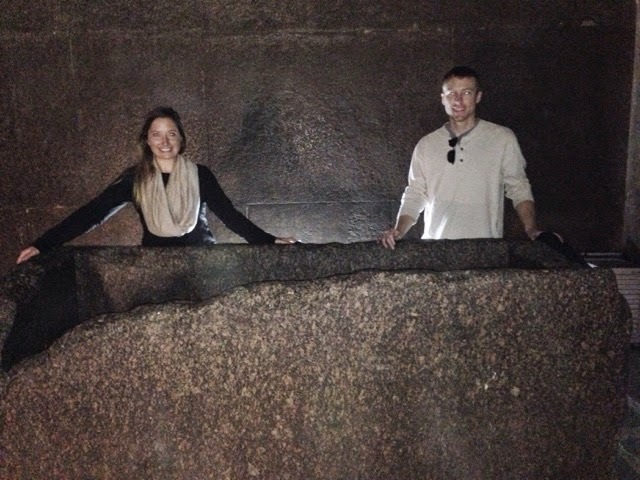 The final tomb built at The Giza Platea circa 2510 B.C. is the Pyramid of Menkaure. This is by far the smallest of the three main pyramids at just over 228 ft high. Now it's time for the epic panoramic view you've been waiting for. It has been a wonderful trip. Made me fall more in love with Egyptian history than ever. Perhaps a visit to The Valley of the Kings to see King Tuts tomb is in our future?? 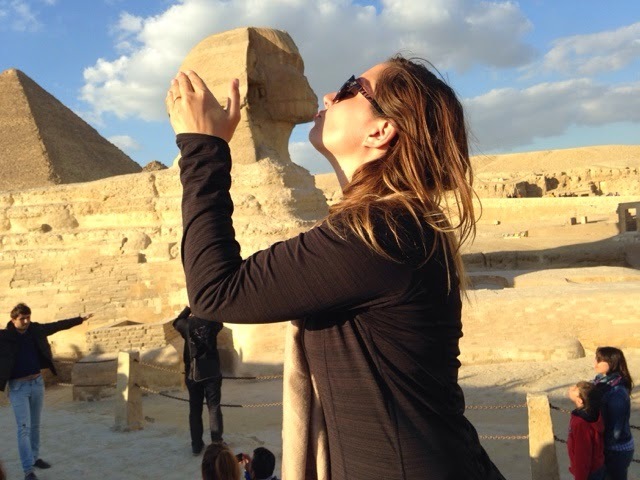 Your perspective shot of you smooching the Sphinx is perfection!